An autobiography by BIll Pollack. The title comes from the famous Cadillac-powered Allard J2 that was raced to many wins by Bill Pollack, all while running on red wheels and white sidewall tires. Read more about this new soft cover title from Brown Fox Books by clicking on the yellow title at the left, or use the Order Now button to place a secure online order using your credit card. 6x9, 224 pages, including 32 pgs of photos. $23.95 Plus $4.00 S&H. We now have a third printing in stock, printed on digital press and coated paper. From extensive taped interviews with the subject, William F. Nolan documents the extraordinary life and career of Phil Hill, from his days as a youngster driving his aunt’s Packard to his six-year stint as a driver for Enzo Ferrari. With the Ferrari team in 1961 Phil Hill became the first American to win the Grand Prix Driver’s Championship. 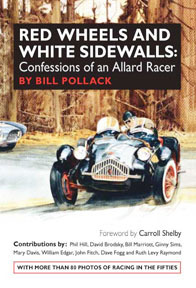 This revised, expanded edition of the only book on Phil Hill goes on to cover Hill’s races with Carroll Shelby’s Cobra team, Ford’s GT40s, and Jim Hall’s Chaparrals. NOTE: We no longer have perfect copies for sale, but only only slightly hurt books. A corner of the hardcover board is bent, but they are wrapped in a perfect dust jacket. Only blemished copies are currently available S&H $4.00 USA Media Mail. A fine new edition from Brown Fox Books of the only book ever devoted to Barney Oldfield, the man who got his start at the turn of the century racing Ford’s 999 and winning the Manufacturers’ Challenge Cup, at Grosse Pointe, Michigan, on October 25, 1902. June 2003 marked another milestone with the 100th anniversary of Barney Oldfield driving 999 to a record mile-a-minute run at the Indianapolis Fairgrounds dirt oval. Read more about this new, revised and expanded edition of “Barney Oldfield” by clicking on the yellow text. 6x9, 232 pages, including 40 pgs of photos. Now Available. The Revisited Edition of the classic motor racing book The Stainless Steel Carrot is now available. Author Sylvia Wilkinson has added a new 45 page chapter catching up with many of the people who made the BRE team successful and the book compelling, including John Morton, the team’s number one driver, who went on to race professionally for another 35 years. Fully redesigned, the hardc0ver 6x9 inch book features about 165 images on text pages and in four color on coated signatures. We have a few copies of Barney Oldfield signed by William F. Nolan. No extra cost, just ask for one. Our Barney Oldfield title earned the Award Finalist label at the 7th Annual Independent Publisher Book Awards. The certificate in the category of Sports / Recreation books was presented at BookExpo America.